One of the frequently asked questions that our servers, bartenders, and hosts get from customers is who makes those beautiful delicious pies? Okay, flattery aside, they do always ask about our wonderful bakers from Peace Pie Company. Peace Pie Company was created by Lorri Smith in 2015. She started out just making pies for a variety of local businesses such as L’attiutdes and private customers. But it wasn’t long until she spread her loves of pies to the farmer’s market for everyone to enjoy. Our owners loved Lorri and her pies so much that now she has her own little corner of the world in Iron Bay Restaurant and Drinkery. From then on, Lorri Smith and her team of bakers have been making the desserts so proudly displayed in our deli case. Peace Pie Company is a very important part of Iron Bay Restaurant and Drinkery. They provide beautifully made and even better tasting desserts to anyone who walks through our doors. 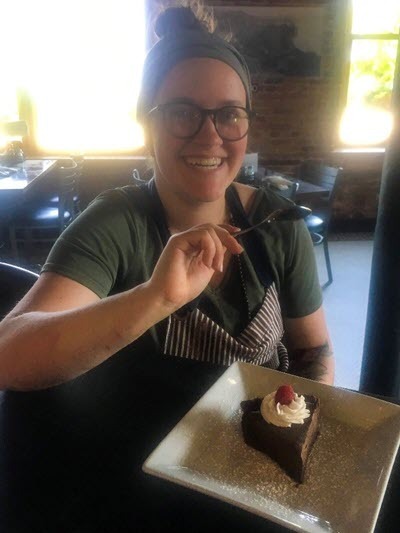 We are so grateful for all of the hard work that our bakers put into these desserts that we would like to feature the faces that make your favorite sweets! Lauren is one of the bakers from Peace Pie Company. She is originally from Escanaba, but she is in Marquette because she’s a student at Northern Michigan University. She is a senior majoring in outdoor recreation and leadership management. Outside of working in the bakery, Lauren loves rock climbing whenever she gets the chance. 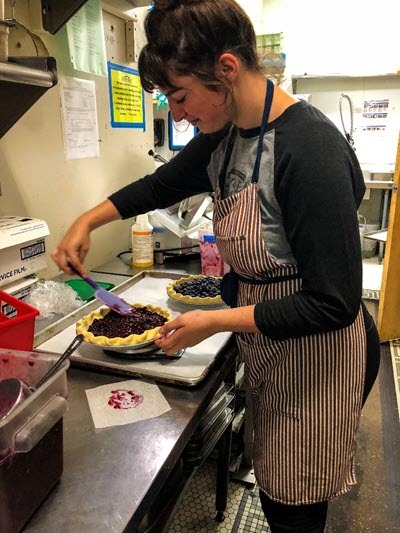 She has been baking with Peace Pie Company for two months, but she loves working in the bakery because they are like her second family. Something that you may not know about the bakery is that it’s so small, so you get to know everyone that you work with very quickly and well! Her favorite dessert to make is the mesmerizing tie-dye cupcakes, but her favorite dessert to eat is the Lorri Doone! If you’re a beginning baker, Lauren recommends to not be afraid to try new things, they may just turn out delicious! Ellen is another one of our bakers that makes the desserts that are displayed in our deli case. She is from Negaunee, but she is in Marquette quite a bit since she is a student as well at Northern Michigan University. Ellen is a senior political science major, but outside of work, Ellen sings and plays the guitar. She also loves traveling and being involved in politics. Ellen has baking for as long as she can remember, and she’s had a strong force in her baking career, her mom. Ellen’s mom used to bake at Big Al’s, and she’s happy to be following in her mother’s footsteps. 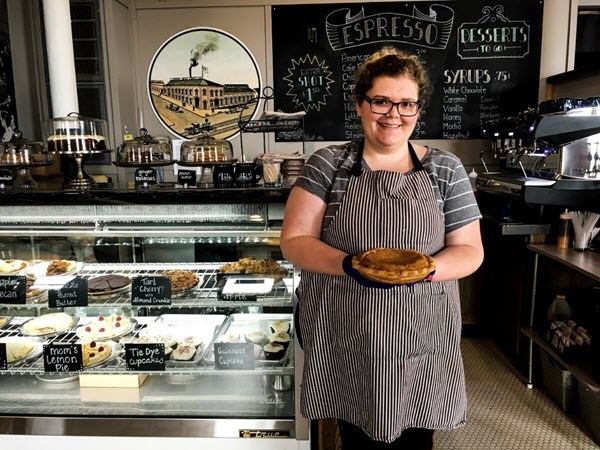 Her favorite aspect about working in the bakery is not just the relaxed and nurturing atmosphere provided by Lorri Smith, but also the air conditioning. Her favorite dessert to make is also the tie-dye cupcakes, but her favorite dessert is the everything cookie. If you’re a beginning baker, Ellen has three recommendations: whip the heck out of the butter, sugar, and eggs, have fun, and share what you make! Lea is another one of our bakers from Peace Pie Company! Lea is originally from Chicago, Illinois, but has moved up to Marquette to pursue her education at Northern Michigan University. Outside of the bakery, Lea and her fiancé love to hike and explore the area. Lea has been baking for fun for her whole life, but professionally, she has been baking for a year and a half. Lea loves working in the bakery at Peace Pie Company because of the staff and family like feel. She loves that so much love and effort go into each and every bakery item, and how hard Lorri Smith works to get the best fresh and local ingredients to feature in these items. Lea loves to make the tart cherry pie with almond crumble, but she’s still waiting for a vegan item to come onto the menu. If you’re a beginning baker, Lea recommends to not feel bad if you mess up a recipe or two, there’s always more flour and sugar to try again! If these cute and hard working faces don’t want to make you buy a pie the next time you come into Iron Bay Restaurant and Drinkery, then we don’t know what will!